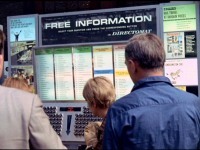 One of the most interesting sequences and props in "The Prisoner" is that of the "information board" seen in several episodes (most notably in the episodes "Arrival" and "Free For All"). In the 1980s, "Prisoner" research trailblazer Steven Ricks discovered that the prop was heavily based on a real life information centre called a "Directomat", and now thanks to Unmutual Website reader Al Samujh, film and photographic evidence of such a device in situ has been located! 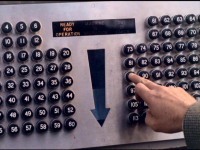 The stills shown here are from the British Transport Films documentary, "The Sixth Rail Report - The Good Way To Travel" (1966) and shows a working machine in Waterloo Station, placed at the location as part of a trial of the machines. Writes Al; " It would have been seen by anyone travelling out of town to Shepperton around the later Danger Man period - who knows, maybe even Patrick McGoohan. As it looks like an expensive bit of kit I wonder if it was placed in The Prisoner as a promo?"